when you’ve got grassfed collagen? Ha ha, Real Foodie joke. But seriously, when it comes to supporting skin elasticity, I recommend you start by consuming the building blocks of healthy skin rather that injecting bacteria into your face. Collagen was a superfood long before celebrities like Jennifer Aniston began recommending it in beauty magazines. Our ancestors knew the unique nutritional value of collagen, and so prepared bone broths, headcheese, calves foot jelly, and aspics to incorporate this ingredient into their day. Now, these sources of collagen have all but disappeared from our diet. If headcheese isn’t your thing (it’s not mine, either), you’re in the right place. 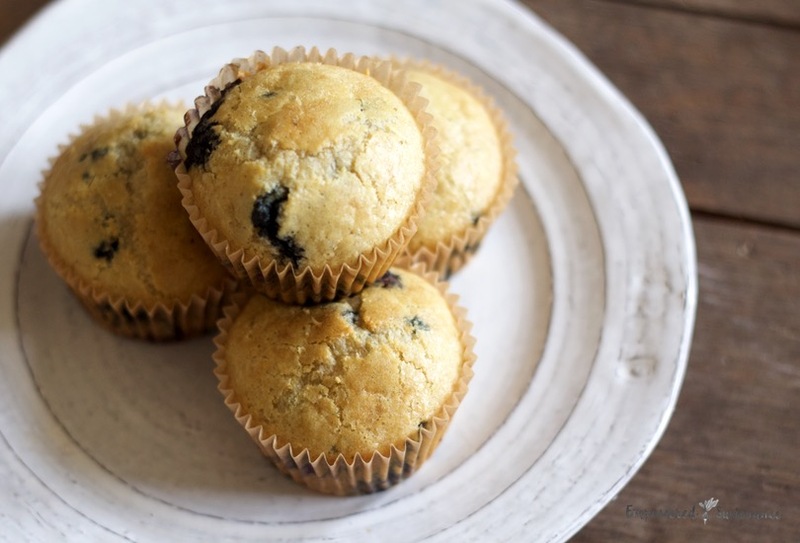 I’m going to show you how to use collagen in muffins, lattes, and homemade protein bars. But first, what is collagen and why is it a critical nutrient? In a nutshell, collagen holds our whole body together. It’s the most abundant protein in the human body and plays crucial role in maintaining the structure of our joints, bones, and skin. Collagen peptides, which are a supplemental form of collagen, are a source of collagen from either beef or fish. When we ingest collagen as a supplement to our diet, we furnish our body with the building blocks it needs to regenerate. Amino acids make up the protein structure of collagen, and these amino acids also have an important role in our wellbeing. Glycine and proline, the two primary amino acids in collagen, support the healing of the digestive tract and also support sleep. Note that collagen peptides are pure protein. Collagen is the only protein powder I use, because it is easily digested and doesn’t contain artificial ingredients unlike most protein powders. Collagen reduces hunger, as shown in clinical studies. When I boosting my morning coffee with collagen and have this alongside my breakfast of eggs and veggies, I go 5 hours after breakfast without hunger. Collagen supports joint and bone health, as collagen makes up to 90% of bone mass. In one study, collagen supplementation reduced the pain associated with arthritis, even in severe cases. Collagen supports digestion, as the glycine in gelatin stimulates stomach acid production and thereby nutrient assimilation. Collagen supports balanced hormones when eating with meat-based protein. The amino acid profile of muscle meat (such as a steak or burger) can spike cortisol, a stress hormone. The amino acids in collagen balance out the amino acids in meat, allowing your body to reap more nutrition. Looking for more ways to enjoy collagen? 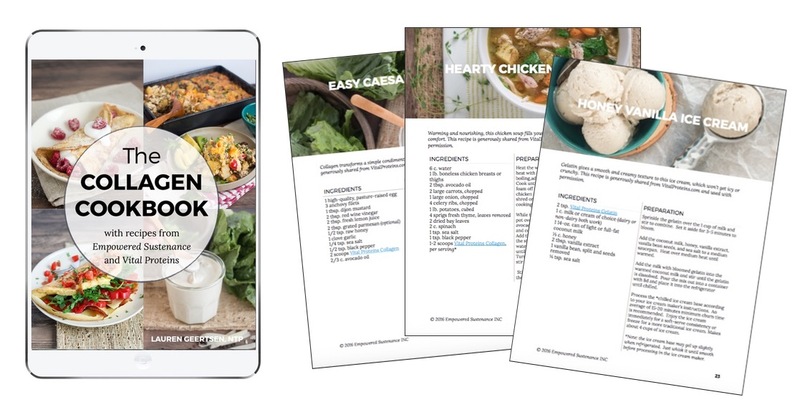 I created this photo-packed cookbook in collaboration with Vital Proteins, my favorite source for grassfed collagen. It’s available to download for free below. OMG, I've been waiting for someone to make a cookbook like this, congrats and boat loads of thanks! I had no idea I could use collagen in so many ways. I love this cookbook, and thank you for putting it together for us! What is the difference between collagen and gelatin? Collagen dissolves without texture or thickening, but gelatin gels. You can use gelatin to make homemade gummies and jello. These two ingredients have a similar nutrition profile, but they are not interchangeable in recipes. Do you have a coupon for Vital Proteins? It is Vital Proteins’ policy not to offer coupons. Is Great Lakes Gelatin and Collagen a good source? 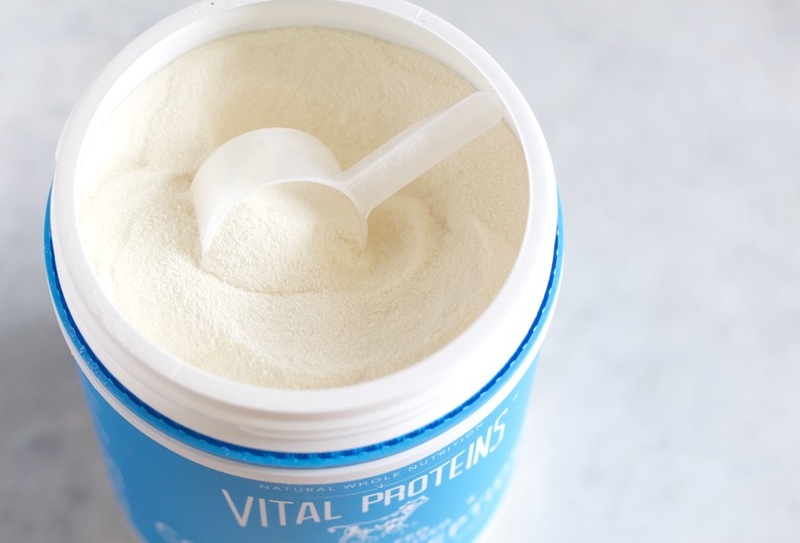 I prefer Vital Proteins, because their packaging is much more convenient, I’ve met most of the team members and the founder, and they offer free U.S. shipping. But Great Lakes products are grassfed, and can be used in any of the recipes I share. What about the gelatin from my grocery store? I do not recommend Knox gelatin. It comes from factory-farmed cattle. Due to the sick living conditions, these cattle are not a good source of nutrition.